copyright infringement by the High Court of Justice in London today. I’m not going to bore you with countless 100% clips. Just open this one file. It is a 100% screen shot of a tiled view of the same raw file from a Canon EOS 550D (aka Rebel T2i), taken at ISO 6400. 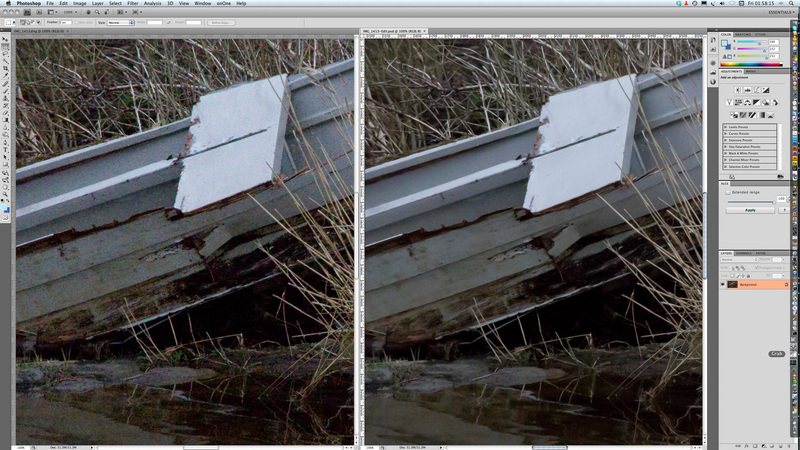 On the left, you see what Adobe Camera Raw 5.6 does with this file using no sharpening, 25 Luminance NR, 50 colour NR. On the right, you see what LR 3 Beta 2 does using the same settings (LR noise reduction has some further options – these are not adjusted). When exporting the LR image to Photoshop, a dialog box appears saying you may need to install Adobe Camera Raw version 5.7! At the time of writing, version 5.7 is not yet available. But LR3 Beta 2 knows it exists… I used LR Rendering for this sample. The 12,800 shot is by no means bad either. You could compare it with ISO 1600 shots from the first 10 megapixel CCDs. Trust me, the LR 3 Beta2 result is superior both to the Canon in-camera JPEG and the Canon DPP processed result. Had I the time I’d post examples of every ISO from 100 to 12,800 and you would see something very special – the increase in size of ‘grain’ with each speed step, but nothing more. NOTHING more than a proprotional increase in grain size, just like film used to be. And another things – it works on everything. It works on old files, new files. RAW files from before the Ark got stuck on Ararat. Night shots taken when night shots could only make 7 x 5 inch prints. Nikon, Canon, Sony, old Minolta, Pentax, Olympus – download this beta, and you just discovered great pictures in the stuff you thought was rubbish because you accidentally used ISO 800 when that meant shaking the pepperpot over your soup! Tip: to use Lightroom use a front end, just set Photoshop as your editor, and after adjusting the pic hit Command-E – same as hitting the Open button in Adobe Camera Raw. Go straight to Photoshop, Do Not Pass Go, and do not (yet!) spend £200! Skillset has launched the most comprehensive searchable database of creative media courses on offer in the UK. The Skillset Courses Database also helps users to find the best, industry endorsed media training available by indicating which courses and institutions have been awarded the Skillset Tick kite mark. The Skillset Tick indicates to students and employers that a course or institution has undergone a rigorous, industry-approved assessment and has been designated a centre of excellence in creative media disciplines. The database contains information on a total of more than 8,000 creative media courses at all levels – from undergraduate degrees to CPD short courses.